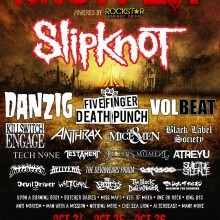 Slipknot are set to return to the U.S. with their own KNOTFEST–an extraordinary three-day metal and heavy music destination festival–to be held October 24-26 at San Manuel Amphitheater & Campgrounds in San Bernardino, CA. This marks the first time KNOTFEST will be held in the same location for multiple days. 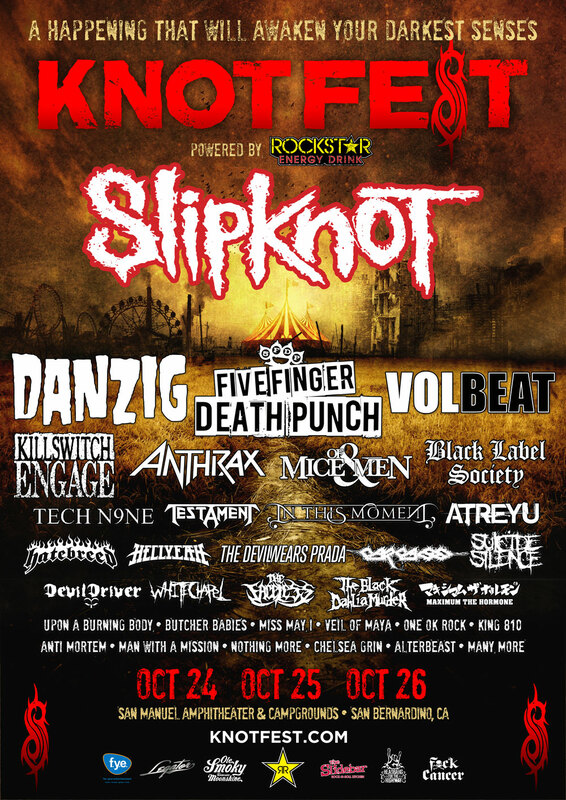 KNOTFEST U.S. 2014–powered by Rockstar Energy Drink–will feature a Slipknot-curated lineup of over 60 bands performing on five stages on Saturday and Sunday, as well as a Friday night VIP Pre-Party Bash, band performances and other activities for those that purchase VIP or Camping Packages. The weekend will feature performances from Slipknot, Danzig, Five Finger Death Punch, Volbeat, Anthrax, Killswitch Engage, Tech N9ne, Of Mice & Men, Black Label Society, Testament, Hatebreed, Atreyu, In This Moment, Carcass and many more. A list of artists performing each day is available now HERE. Slipknot will close the Main Stage both Saturday and Sunday, with unique sets each night, featuring brand new music and an entirely new stage set and experience. In addition, all ticket purchasers will receive a digital copy of Slipknot’s forthcoming album, to be delivered on release date. Every KNOTFEST has been a fully immersive experience for fans, and this one ups the ante. In addition to performances from more than 60 of the heaviest bands on the planet, attendees will descend into an apocalyptic underworld featuring over 20 festival attractions including a Slipknot Museum (curated by the band), carnival rides, a zip line across the festival grounds, drum circles, pillars of fire, freaks, fire-breathers, stilt-walkers, and so much more. Campers and VIP ticket holders receive a free Friday night KNOTFEST show with Suicide Silence, The Black Dahlia Murder, Butcher Babies and more, as well as an early preview of the festival area and Slipknot Museum showcasing the band’s history. VIP ticket holders also can attend a Friday night special VIP Pre-Party Bash with music by Slipknot’s DJ Sid. 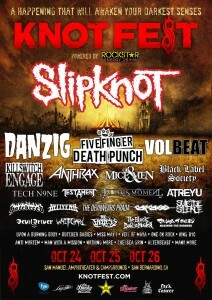 KNOTFEST tickets are on sale now at www.knotfest.com. Limited quantities of Early Bird Discounted 2-day and 1-day festival tickets, as well as Camping Packages are available while supplies last at www.knotfest.com. VIP packages go on sale Wednesday, July 9 at 10:00 AM PT. A limited number of four different levels of VIP packages will be available with amenities including exclusive merchandise bundles, early entrance to a 21+ VIP Lounge, Pit Pass or the best Reserved Seats in the house, preferred parking and more. Hotel packages and travel packages will be available soon. To view all ticket options for KNOTFEST, visit HERE. Doors open at 11:00 AM each day and the show runs until 12:30 AM on Saturday and 11:30 PM on Sunday. The KNOTFEST camping area will be located in a grassy county park adjacent to the venue’s VIP area. KNOTFEST is a short drive from San Francisco, Las Vegas, Phoenix, Tucson, San Diego, San Joaquin Valley, and many more cities in the Southwestern USA.